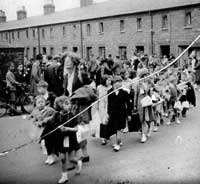 Many interviews were conducted by the Living Archive with people who had either been evacuated or who had received evacuees into their homes. “True that some of the evacuees’ habits “left a lot to be desired” Bed-wetting, and “some of them never had a bath. They didn’t know what the luxury of a bathroom was”. Although most people were very accommodating and tried their best to help the evacuees there were inevitably, clashes between people. “Londoners drank more and looked for (a) special life that wasn’t there”.